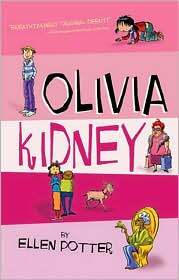 Olivia Kidney is thoroughly fed up with having to move all the time. Olivia's father works as a building superintendent and though he is the "absolute nicest man in the entire United States," he is a rather useless superintendent who is always getting fired. This time George Kidney is living and working in a rather grim building full of "awful" people who never smile and who are always grumpy. One day, when Olivia comes home from school, she discovers that she has lost her keys. No one seems to want to let her into the building until a boy called Branwell turns up. Branwell is a kind person and he uses his key to let Olivia in. Of course Olivia still cannot get into her apartment without her keys and her father isn't home, so Olivia sits in the hall to wait for her dad. Olivia's next door neighbor sees Olivia out in the hall and she insists that Olivia should come into her apartment where she won't be messing up the hallway. Olivia is amazed to see that everything in the old lady's home is made of glass or see-through plastic. Even the floor is transparent and Olivia can see the family in the apartment below. It is all very bizarre, and the story the old lady tells Olivia about her life is even more peculiar. This is just the beginning of a very strange day. Olivia meets several of her other neighbors including a former pirate, a lady who plays mesmerizing music using a sea shell, a boy ghost, and a psychic. As the day progresses Olivia learns that many of the people that she meets are connected, though they don't necessarily know it. Furthermore she is finally given the tools she needs to let go of her own feeling of pain and loss. In this unique, quirky, sometimes funny, sometimes sad book, Ellen Potter takes her readers to a place where all kinds of strange things happen. Often things are not as they seem and Olivia - and readers - have to reassess the situation often. In this book Ellen Potter describes, with great skill, the events that take place during one very special day in a girl's life. As the story unfolds we learn a great deal about Olivia and her family, and we discover that there are all manner of strange associations between the eccentric people in her building.